On Monday I returned from Poland. With some brothers we took part in World Youth Day in Krakow. At the same time, one of our brothers participated in the gathering of young French Protestants which was in Brittany. 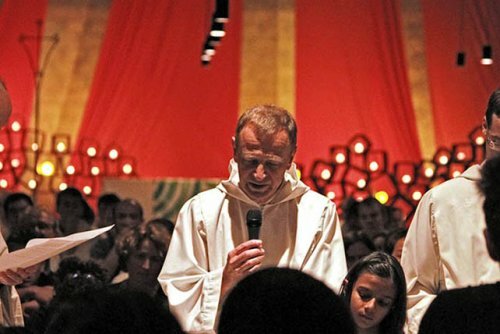 In Poland, during the week before WYD, the brothers were at Auschwitz, near Krakow, and led prayer with young people who visited the concentration camp of World War II. Then we also led the prayers in a church in Krakow. Young people from around the world passed by for a moment of inner peace. Pope Francis deeply encouraged all the young people to realize their faith by reaching out to others, to those who suffer. And to the hundreds of thousands who were there, he proposed Saturday night, in the middle of his speech, to have a long moment of silence. So I told myself: in this world which is undergoing great upheavals and where we are so often disconcerted by the violence, it is important always to take again such moments of inner peace, peace of heart. Not to withdraw into ourselves or to run away from the difficulties. But in order to see reality better, to understand events. Jesus spoke these words the night of his arrest, just before his passion: "Let not your heart be troubled, do not be afraid." And these other words: "I leave you peace, I give you my peace." In prayer we always want to welcome his peace. How? By a simple trust in his presence, that we can renew in the course of our days. He is present and so nothing can separate us from the love of God. This peace that we receive enables us to listen to Christ’s call to open ourselves to others, not to be afraid, but to go towards those who are different from us and sometimes close at hand—the sick, the disabled, the homeless, foreigners. Christ invites us to bring friendship where mistrust seems to stifle fraternity. We are called to create brotherhood beyond all borders. What matters and what transforms the world is not so much spectacular actions, but the authenticity of our approach. I would like to make a concrete proposal in this sense: that we all go by twos or threes towards migrants to listen to them, to listen to their stories, to spend time with them. Then—who knows?—further steps will follow. Creating brotherhood is central to the vocation of our community. We are so different from each other, coming from different Churches, countries and continents. This diversity is of great beauty, but also requires us to invest ourselves with our whole person in a life of communion, to be truly brothers for each other. Saturday night, our brother Maciej will commit himself for life in our community. He comes from Poland, he bears within himself the faith that enabled the Polish people to pass through the great events in its history. Saturday we also celebrate a very special feast, the feast of the Transfiguration of Christ. One day, three disciples saw Jesus radiant with light, they saw that he really was from God and that through him God was illuminating us as well internally with his light. In our nights we can look towards the light of Christ. Even if it is little, it never goes out. The apostle Peter, who was present, wrote: You do well to look towards the light that shines like a lamp in a dark place, until the day breaks and the morning star rises in your hearts. One last word. We are delighted this week by the group visits from far away. A child, Maya, will name all the countries represented this week. But I would particularly like to greet the group from China. We feel very close to them. Every Friday night we pray for their country, for Christians in China. I also wish to give a warm greeting to the Orthodox youth from various countries who are here. Their presence widens our hearts. And we are glad about the presence these days with us of a group from Kenya; they know our brothers in Nairobi well. Among us there is Mgr Julian, the archbishop of Kuala Lumpur, Malaysia. And the Anglican Bishop Michael from the North of London. Tomorrow a group from Haiti will come, with Bishop Pierre Dumas. That beautiful country so often undergoes great trials, but trust in God is so strong that people remain standing. The communion that we can live between so many different countries is a reflection of the light of Christ who came to bring together all humanity in God’s love.